Mysuru: Stung by the series of raids by the Police and the officials of Mysuru City Corporation (MCC) on illegal massage parlours masquerading as licenced beauty parlours and the overall impact on the beauty industry, Mysuru District Beauticians and Beauty Parlours Association has demanded immediate closure of all illegal beauty parlours and massage parlours that are being used to promote flesh trade. 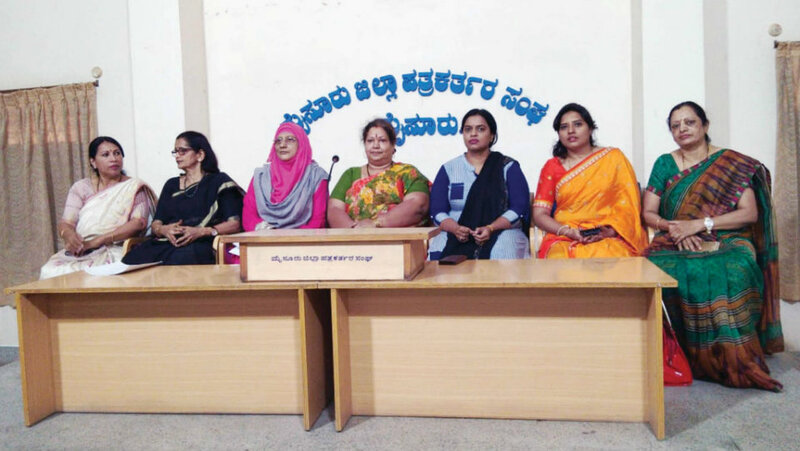 Addressing a press conference at Pathrakarthara Bhavan this morning, office-bearers of the Association said that the raids have brought a bad name to the beauty industry. “There are over 600 beauty parlours in the city and almost half of them have not taken permission from the authorities and they run illegal business. Some beauty parlours run massage parlours inside their rooms though they have displayed the signboard of beauty parlours outside,” said Zerina Imthiaz, Past President of the Association. All licenced beauty parlours do legal business and have introduced and maintained the concept of beauty in the city. “Unfortunately, there are some black sheep who are bringing disrepute and bad name to the industry. Following the raids, people are looking at us suspiciously and our families including children are rebuked as their family member runs a beauty parlour,” she said. Association President Sujatha said that they were tired of smear campaign. “We appeal to people not to generalise. We come from well-to-do families and there is nothing illegal in our business and we are serving our society. We have provided the Police and the MCC a list of over 200 massage parlours that are being run illegally as beauty parlours and where flesh trade is encouraged. However, no action has been taken against them,” she alleged. “Our Association has gained a good reputation not only nationally but also internationally. We are supported by other networks like distributors, product companies, professional trainers, etc. Unfortunately, wrongdoers have caused irreparable damage to the industry,” she said. “We have no objection if the Police and the MCC shuts down illegal beauty parlours. Some of the unlicensed beauty parlours do not even have washrooms for women and we have received many complaints from customers and the staff,” Sujatha said. Zerina Imthiaz said that over the years, the Association members have personally visited all parlours and catalogued each and every one. There are many parlours that are run illegally by unqualified persons. “The Association has no powers to raid such illegal units. We request stringent action by the Police,” she said. “The MCC must not issue licences to open parlours and spas indiscriminately. Proper certificates, authentication and past experience must be checked before issuing a licence. We are now in the process of registering all beauticians and helping them procure work in their localities,” she added. Association Vice-President Uma Jadhav, Joint Secretary Sabeena, members Prathibha Shetty, Veda Rai and Shantha Gowda were present. The usually deserted Pathrakartara Bhavan with only one or two press conferences daily, wore a colourful look this morning with many members of the Beauty Parlour Association trooping in to address the media. After the press conference, the Association members posed for group photos as well.